VRSA comes to me via Reg here at Heavy Planet, after hearing of my love of all things stoner and doom. I tip my hat to him for this interesting foray into doom, stoner, and the un-understandable. 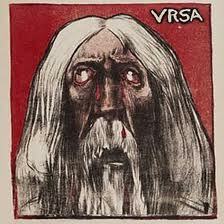 VRSA is a hard band to categorize, although everyone (on the net) calls them some form of doom, it's not the first thing I would think of. I mean that I can definitely hear the doom influences, and even the occasional spattering of stoner throughout (although I wouldn't call them a stoner band either), it's just not what I would expect to hear when handed a 'doom' album. It's almost like alternative doom, or dark metal or something....I can't classify it. The nearest comparison in style and sound is that of Baroness - but even that is a loose one. Certain sounds, styles and tracks (especially close to the end) do bring Baroness to mind, but only for a moment; then the group dives into another direction and the feeling is lost. Old Man Gray is a mash-up of slow (but not doom), and fast (but not real fast) guitars, with drum beats to match. The fourth track, "Episonic," is the key example of this, one guitar plays a mellow lick repeatedly while the other guitar - with the help of the set - chime in periodically with a up-tempo chord bit, then fade out, then back in again; followed by a semi-breakdown section where all the instruments come together at the quicker tempo for a combined jam. It works pretty damn well (also no lyrics on this one). The lyrics themselves are multi-focused, with some songs having clean vocals, others with a splash of growl. Some tracks focus the singer in the foreground, with his words crisp and clean; while others have it faded more into the background, battling with the guitars for center stage. It sounds really weird - which it is - but it works great for them. This album is good, not great, but good. I can't put my finger on what they do well or bad, but sometimes you don't need to. This is kind of a crap review/introduction to VRSA, but I can't pinpoint anything about the album; it's style, what makes it good, what stands out, it's all a swirling, living creature of an album, and while it may chew up your favorite pair of shoes, you still love it.